Used for about 2hours straight with NO troubles! Dremel comes through again! Famous for their rotary tools, this table top jigsaw will impress you all the same! Make detailed cuts in materials such as wood, plastic, laminates and metal! The Dremel Moto-Saw MS20 is a quality scroll and coping saw that is easy to set-up, easy to use, easy to clean. The attaching "C" clamps make a very secure base. The unit is compact but not so compact as to lack the power needed to do the job. The Dremel detaching feature also offers an alternative to scroll sawing your project. A variety of saw blades for the spectrum of jobs this handy tool can perform is also included. A very good investment for the dollar & will pay for itself in your first or second project. We bought it! We tried it! We love it! Next we will see if our portable Halo Bolt ACDC 58830 will power this portable saw instead of having to use an extesion cord! We live in a studio apartment and our specific project required us to make some teeny tables to use as props for a finger puppet show. With literal lack of real estate available, we tried to first create them by hand! You know, out on the patio with craft wood, an inexpensive crafters handsaw and glue. No problems, right? Well, our first attempt at making them by hand was pretty good, but our hand-sawing skills ended up being like squiggly lines in the road. The legs and tabletops did not quite line-up squarely. 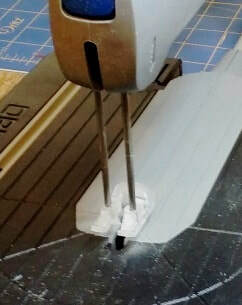 Though puppets do not mind imperfect wobbly tables as props, we needed to cut straight lines for future projects and to do it with ultimate precision! Projects like: foam-core frames, puppet sized doors made from thin veneer, CD crate holders, and so on! After price checking around and learning that this tool is NOT readily available off-the-shelf anywhere in So. California, we discovered the best deal found was on Amazon. With our Prime account it arrived pretty quick and in good shape from the seller! As you can see, the entire unit is really compact! The saw clamps to our banged up butcher block crafts table very easily. Just pop in the metal "C" clamps to the underside of the saw table, tighten down onto your work surface so that it will not move and you are ready to go! ​The Dremel Moto Saw comes in a grey custom molded case. The very long ACDC power cord is plenty long to reach just about any wall socket and the Vacuum Adapter aids in keeping dust at bay fairly well. With the adapter you can attach a small hose to the underside where the vacuum adapter is located. Something along the lines of a small ShopVac type hose should really keep your work area minimally dust free. In our situation, we used a small plastic bag that is held on by a small hair rubber-band. Just keep in mind, no matter the size of saw, fine dust will go where it wants to! On the machine itself, tabletop, even you! Because of that, we wear a mask and keep small brushes nearby to help keep our work space clean, dust off the machine and all its crevasses! Regarding safety, there is an adjustable clear blade guard that keeps your fingers safe from harm no matter the size of material you are cutting. With that, this saw can cut various sizes of wood, but keep in mind, the thicker the wood the slower the saw speed should be for best results. Our first project required us to cut 1/16th craft wood and it cut through it like butter! We look forward to seeing how it cuts through laminate, foamcore and other thin materials! Thick adjustable blade guard that goes up or down to protect fingers. As for accessories, if you are looking to do some precision angle cuts, the 2610031628 Miter Gauge is a great accessory we plan to buy soon. It is an O.E.M authorized part made solely for the Moto-Saw MS20 and is available on Amazon. Replacement wood and metal blades are available on Amazon as well! Buy it! Try it! You'll like it!! Just so you know, we are humble participants of the Amazon Services LLC Associates Program. This means by clicking on our affiliate links you are helping support us. EVEN if you do not purchase the Dremel Saw. NOTE: Some vetted links will direct you to various non-Amazon websites that might be of help to you! Puppetry has been presented on TV, in many Broadway plays, at birthday parties, right down to the smallest of Sunday School class rooms. BUT all of them required one thing, a stage! With that, we are happy you are here! If you, like us, are looking for a stage or need a few new ideas, we are here to help lend our opinions of 20+ years in dealing with various stages! ​​Table tops, behind couches, your other arm with simple material draped over it, wearable puppet stages, doorways, to even the back of a piano! Yep! Bruce's very first solo show took place behind an upright piano in a coffee shop. Because he had mastered the 5 Basic Steps he learned at various conferences, and that we share here, he was able to pull off the challenge of singing 2 songs and performing 1 skit, solo! He was asked back and was even given a section of the shop for his next show, but that prompted him with a big question! What kind of stage should he have? Where to start?! Yikes! All this was before the internet, too! All he knew was that he had a few puppets, he likes to move around a lot, and use "big" 2D props. He decide he would need something roomy. Also, Bruce "puppeted" on his knees, so he needed something roomy and "short" according to his height from his knees to his raised arm at the elbow. But the big deal of the day was, WHAT will fit into his 1967 VW? What to do, right? Now, being hidden is not a must. Actually, it can bring another dynamic to your presentation! We have done that many times and it has been the most talked about part of the presentation post-show. It sets you apart from the rest, and will most likely get you a call-back, but we digress. Our suggestions are based on personal experience as adults who are careful during setup and strike-down. ​If you are building a new youth puppet team, please factor into your decision making their safety first! RATING C ​Materials Cost $50-100 (not incl. fabric, hardware, etc) Car Fit? Maybe. PVC Pipe is the most affordable stage around! You can builst a stage frame in one afternoon. Covering it with large amounts of fabric is a breeze too!. Replacement parts can be found at any home improvement store by the penny. BUT, this is where we stop as far as promoting a PVC stage in the professional realm. Most puppeteers start with a PVC stage out of necessity, but mostly because of the myth that if PVC can survive landscaping, it must be strong! Yes and no. Its landscaping purpose is to be laid in a certain way, 2ft underground, nice and still to never be disturbed again, right? But even underground, they become brittle and crack causing water leaks. So, imagine what a short a life span they will have being man-handled show-after-show, year in and year out! That, and labeling / color coding them so anyone can put them together is a bear. What do you do if ONE piece goes missing at an event? It happens! Often. Do not get us wrong! They are great to get you started. Just keep in mind they do warp, become loose and flimsy and they eventually snap because of age. Plastic does not age very well. In short, consider professional websites do not even list PVC stages for sale. At all! 2nd Tier Puppet Stage using 2 Coleman Lantern stands. Perfect as a backdrop too! We were blessed from the start back in 1996! We inherited an old folding wood stage from a church. It was well used, but it held up. WOOD! The best material for long term use. Whoever designed it, had puppeteers in mind. It has 2 large front panels and 2 side panels (aka wings). The old stage had standard door hinges so that it could only fold down to about 6 inches high. When we built our new stage we decided on 3 foot long piano hinges. Expensive? Yes. Worth it? Yes. They are much more durable and most importantly, the stage folds completely flat. Other hardware was "L" brackets on each corner. That would total 16. It is a must have if you want an on-the-go wood stage to last & to hold its shape. Our "brick facade" wood stage is 52" high with three 48 inch piano hinges. The "brick" is actually white foam core painted by hand with a typical rectangular sponge and differing colors of pink and wine, then each brick patiently outlined in black. The mortar is actually a crafts paint called, Mortar! Velcro is how we attach the foam core to the wood frame. Non-adhesive Velcro is stapled to the wood frame and adhesive Velcro is stuck onto the back of the foam core. We have found that adhesive Velcro attracts dust-bunnies like crazy in which causes the Velcro to not work as efficiently -- not so "sticky". When it comes time to replace the Velcro on the stage, we just use a screwdriver to pry off the staples and lay down a new section of Velcro. The foam core facade is stored in a separate box when not in use. If taken care of, foam core can last decades. Ours has! When our first wood stage was rather old, we decided to build our 2nd stage to the height based completely on the shortest puppeteer and not some random size. Yes, the shortest one as to avoid having to schlep around booster boxes and risers since it was just the two of us. Can you find our wood stage packed up and ready to roll? This show was a our 3 stage setup! Our brick facade is in a carboard "envelope" all the way to the left of the photo, drapes folded way to the right out of frame, and so on. Our wood stage is at the bottom of the photo and since it is "hallow", it fits our blue puppet tub and emergency Stanley tool bag perfectly! We call it, "The Punch and Judy" stage. It is a 3-panel fabric covered poplar wood stage. It has door hinges instead of long piano hinges covered with various light weight fabric that is stapled on. The stage window, or opening, is framed by molding painted in gold and distressed a little with gold paste. It looks silver due to the camera flash. A few "gems" were added in just a few places to bring some sparkle to the front. Not too much. 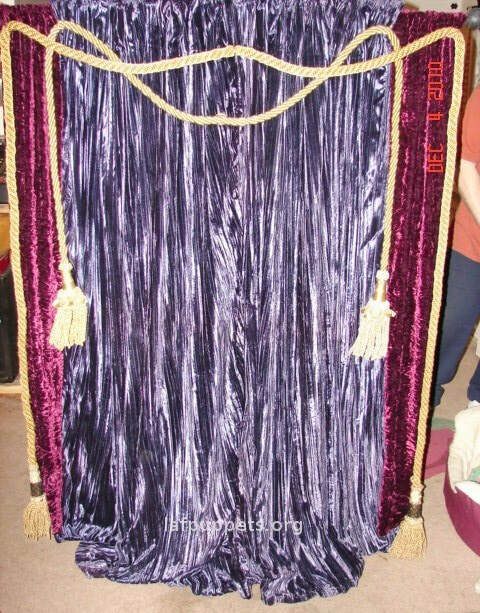 The red velvet drape has cafe rings that are hung a dowel. You can open the drape by hand or rig up a simple drapery pulley system using some type of black Dacron fishing line or something nice. Cool video on how to make a durable child-sized wood folding stage. Complete with drapes! ​The photo above is of Dale Von Seggen and the enormous aluminum tripod stage that Creative Ministry Solutions has to offer for sale here. This huge setup is around the $1200 range. You can purchase a section or the whole grouping. They offer fabrics already sewn to size and come in some nice neutral colors. If you are a large puppet troupe, a church or a ministry that plans to have a puppet ministry/team/group for decades to come, THIS is the best way to go! Aluminum stages are super light weight, easy to wipe clean, nearly indestructible, and that is why they are expensive!! That's it, folks! Thank you for your time. God Bless! ​* We do not receive any type of compensation for our reviews of or opinions of puppet stages. ​Author, Tambrateer is a participant in the Amazon Services LLC Associates Program, an affiliate advertising program designed to provide a means for sites to earn advertising fees by advertising and linking to Amazon.com. If you are a puppeteer or traveling artist looking for a way to power a simple fan, prop, even laptop without the need of an extension cord, then please let us tell you about the Halo ACDC 58830 Bolt power charger! It has been such a blessing to us! If you, like us, have found your electronic device battery running low just before show time, you have come to the right place. Frustration. That feeling of helplessness especially after many months of preparation shows up. It somehow became best friends with your device. You know, the one staring motionless into space. Sitting there ignoring you and your plea to just, "Work!" Sure, you can make a last ditch effort and gallantly run to your car to use the cigarette lighter USB charger. With, "You are my only hope!" running through your mind your your gut tells you the chances for a full or even 20% charge is zero. Nill. Nada. It is just not going to happen! But you try anyway, right? We all do! But what if you could power your device a different way? No extension cord from an AC wall outlet, at all? Just the AC adapter from the Halo Bolt to your device. This is what sold us on this product! We came upon this powerhouse portable charger when googling for, get this, "How To Clean Your Car Battery Terminals!" Yep. We were browsing to see if there were any "new" products or gizmo ways to clean car batteries! A Halo Bolt came up in a search on Amazon. The husband and I looked at each other and decided to go down the rabbit trail to inquire more about this object. After we tossed a coin for which color to choose, we made our purchase and waited for its arrival! Once received, we quickly became friends with it. Our rose patterned Halo came in a beautiful black box with mini-jumper cables, USB-to-micro USB cable, AC adapter, carrying pouch and quick starter guide. And, it was pretty much fully charged too! To test its advertised limits, we did try running a hairdryer via the AC outlet and it failed! It would not even “wake up”. THAT is a great built-in SAFETY feature in case little hands get a hold of it! This proves that this Halo model will only allow devices to run at 65 watts or less! They are permitted on airplanes per the FAA Website. This makes managing your cell phone, digital camera and other mobile devices much easier to maintain when traveling. Great for campers or those who live in rural areas and/or locations prone to power outages. The super bright LED flashlight powers up quickly at the push of a button. To us, it is not too heavy weighing in at a mere 2lbs. A mic stand is much heavier, right? Its size is small enough to fit in your hand, slide easily into a backpack, car glove box, or large purse. Besides jumping our friends SUV, we have found that the two 5V/2.4A USB hubs, in fact, do allow you to charge multiple devices at once! As for the 120-volt sturdy AC wall outlet, you can amply charge larger devices like laptops or run a typical desk lamp, small fan, book light, and more! During an outdoor event, it effortlessly powered my 14" digital photo frame from Amazon for 4 1/2 hours without a hitch! Thanks to the Halo Bolt, my part in the event went very well! When plugged into house current, it takes approximately 7 hours to fully charge a dead HALO Bolt. We have discovered that it takes about 2 hours per green bar. That is pretty impressive for the amount of Mwh this bank holds! The Possibilities. What It Can Do for You! If you and your team are the creative type of folk who build custom props that have gears, and pullys and things of that sort, then there is a good chance you are going to need to power them. We have used our small hand-held power tool to carve, shape, drill, etc. with no problem. One of our most popular props was called, "The Control Center" for VBS Hero Headquarters. But to us, one of the best uses for a Halo Bolt is to power the ever popular UV special effect, the 12" black light! You can now have a glowing / animated prop off to the side, outside your stage that will make the audience wonder, "How are they doing that!" No extension cables for anyone to trip on or become brittle over time. The ideas and possibilities are limitless! Heros Headquarters VBS is a great curriculum to incorporate lights, animated props, etc! Author, Tambrateer is a participant in the Amazon Services LLC Associates Program, an affiliate advertising program designed to provide a means for sites to earn advertising fees by advertising and linking to Amazon.com. As you take on puppetry, you will be learning many things over your life time and one thing that is not discussed the most is our arms. The hand & rod type puppet is much like the colorful full-bodied puppets you see on famous TV children shows. These puppets are handled a certain way and our hope is to present to you another angle to consider as you learn how to work a hand & rod type puppet. To start, understanding the "job" your finger tips have all the way down to your elbow should improve your hand & rod puppetry immediately after reading this article. That is the goal. But, perfecting your puppetry skill is up to you. Not only learning about the "jobs" mentioned above will improve your puppetry, but adding a conditioning program to keep your whole arm in great shape is suggested. Though we do not discuss that here, we encourage it. Arm strength will step-up your puppetry game two-fold just like running helps build the lungs. But we digress. Hand: our hand is what works the puppet head, primarily the mouth. If you have animated eyes and eyebrows the hand would most likely work those too! Most puppets are small and light in weight and some can be very heavy and cumbersome to work. Ever try to twist off a lid to a jar of something and your hand cramps? Pretty frustrating, isn't it? Having strong hands will definitely help with solid mouth movement especially if you want to sing the LP version of your favorite song or recite a long poem. You will need to have strong hands; you do not want your hand to cramp during a presentation. Ever! Simple gentle finger exercises will definately help. Learn about mouth movement in this article. Fingertips: fingertips are the eyes of the puppet. The photo below is of our very curious and friendly green sock puppet, Pat Green. This photo demonstrates why the fingers are the puppet's "eyes". If you were to take two cotton balls and tape them to your knuckles, you will see the same result as in the photo, both cotton balls are looking in the same direction as your knuckles, forward. So, wherever your fingertips/knuckles are facing/pointing, so are your puppets eyes. Keeping the "Egyptian" position will take strong wrists. Most new puppeteers experience "burning" in the wrist when they first start out and that is normal. As you regularly practice, your wrist will become stronger and stronger giving you solid endurance for lenghty scripts. No need to go to a gym. A one pound dumbbell is ideal to strengthen your wrist by. A few reps a day will make a difference. Google the many ways one can strengthen your wrist. Thumb: this is the only digit on the hand that can make a hand & rod type puppet "talk". We discuss exactly how this achieved in our How to Make A Puppet Move. But for now, this particular article is simply informative on the different roles and the different parts our arm plays in puppeteering and the thumb is one of them. Forearm: this is comparably the "trunk" of the human body -- the neck down to the waist. The forearm is located from the wrist bone down to the elbow. It holds the puppet up and keeps the puppet body nice and straight. A sure way to keep your puppet up during your LP version of your favorite song or poem is by strengthening your triceps. Keeping tone triceps will be beneficial in having endurance in holding a puppet up, especially if your puppet is appearing often in a skit or song. While watching TV, we try to keep our arm up during all commericals. Believe it or not, it produces results! Elbow: also known as the "funny bone" is not to be dismissed. It plays a very important role with your puppet. We humans prefer to keep our feet on the ground and so do puppets! But we all know most puppets do not have feet! If the puppet does not have feet, alas, your elbow saves the day! Just like wherever your knuckles are facing, your puppet's eyes are facing. The same goes for your elbow. If your elbow is your puppets feet! So if your elbow is not pointing straight down to the floor, your puppet is leaning in one direction or another away from you or worse, the stage! Most likely towards you, as that is our natural inclination to have our head rest on our hand when not "concentrating". This is not a good thing to allow to happen and one of the hardest habits to break in becoming a polished puppeteer. Thank you for spending time with us! We hope we have helped you improve your puppetry game by a little or a lot. Be sure to strengthen your arm with a gentle conditioning program you can do often. Remember to STRECH prior to show time too! Arms, back, sides, etc. A cramp can happen even to the youngest or most fit puppeteers on earth! Tab on over to our Video section and enjoy a few of our skits and songs we have performed over the years. ​Thank you again and God Bless! ​Tambrateer is a participant in the Amazon Services LLC Associates Program, an affiliate advertising program designed to provide a means for sites to earn advertising fees by advertising and linking to Amazon.com. The surest way to become a polished professional puppeteer is to master the five basic movements in such a way that they become second nature to you. Trust us, this takes time and is best achieved by learning the basics followed by many, many hours of practice. Also understanding the "job" your fingertips have all the way down to your elbow brings more insight into learning how to make a puppet move as well. We talk about what "jobs" the fingertips, forearm, thumb, and elbow do here! Many of today’s top puppeteers have stated that the basics are easy but felt it would take 3-5 years before the basics could be considered mastered, second nature to the puppeteer. Many award-winning puppeteers will usually include an advanced technique or two in their show but watch them closely and you will see how much basic puppetry comprises the puppet’s sublte movements. And when the basics are performed fluidly and flawlessly the result is most pleasing to the eye. How do you know you have mastered the 5 basics of puppetry? You will, not can, will be able to perform while blindfolded just like a professional juggler can. ​Entrances and Exits - There are many ways of entering and exiting a puppet stage (We talk in depth about different types of puppet stages here.) But the way most often used is by "walking" up. Most puppeteers have their puppet "walk" up in 3 or 4 steps. You "walk" by bouncing your arm. Gently bounce your elbow with each step, gaining a little more height as you go up towards your stage position. For best effect, start your puppet at a distance of about 3 feet from the stage and bounce your way up and towards the stage. Or, like in the photo, you can come up parallel to the stage in 3-4 bounces too. To exit, do the "bouncing" in reverse. Again, 3 or 4 steps should do it! Posture - The puppet should be “belly button” high and straight. Avoid leaning right, left, backward or forward. Do not lean on the stage. A distance of 6”-10” from the stage is usually best. Be careful that your puppet does not start to “sink” or lose its proper height due to lack of arm strength. The farther from the stage you are, the higher your puppet will have to be. Remember, the puppet's "belly button" needs to always be at stage height. You may need to use a booster box of some sort to achieve this one rule. Eye Contact - Ever been in a conversation where the other person is continually looking around? They do not seem too genuine in having a conversation with you, do they? Same with a puppet. Train yourself to have your hand look to where your puppet is speaking to. To achieve this, you literally need to pose the hand you will be using like an Egyptian dancer (See "thumb" photo below). Your forearm up and hand, palm down, parallel to the floor, "L" shaped so to speak. Now that you have your arm and hand in position, take note of where the tip of your fingers are pointed. Your finger tips are your puppets eyes -- where your puppet is looking! In the photo to the left, "Bad Eye Contact", where do you think the puppets eyes are looking? If you said, "At the stars!" you are correct! The puppet is looking elswhere, not at his audience. It seems like the puppeteer is trying to catch flies rather than operate a puppet. So it is very important to train your hand to become like an Egyptian dancer. Mouth Synchronization - Synchronization is matching the opening of your puppets mouth to the word(s) and syllables they are saying. To make your puppet pleasantly talk, you simply drop your thumb about 2 inches for each syllable of a word. Unless your name has syllables in it, your thumb should only drop once when saying your name. The word lamb is one syllable. The word little has two syllables, lit-tle. The word syllable has three syllables, syl-la-ble. You get the idea. Now, let's try something we all know, "Mary Had A Little Lamb." Mouth action and mouth synchronization along with entrances and exits is at least 50% of good puppetry. Master these rules and you are well on your way to becoming the next Frank Oz (the voice & puppeteer of Miss Piggy(™) and Yoda(™)). You rarely see these TV characters enter the scene stargazing while catching flies, right? 1) Practice in a mirror. Dresser mirror, bathroom mirror, hall entry mirror, reflection in a window, etc. 2) Video your practice sessions. 3) Eventually video your practices with your eyes closed. Better yet, blindfolded. This is a sure way to learn where your weaknesses and strengths are as you watch playback of the video. Muppeteers are looking at a monitor below them, right? They know their puppet SO well, that they have mastered their every move and idiosyncrasies. Just know, what might work fabulously on one puppet may not on another. FINAL THOUGHTS: It is always about the puppet, not the puppeteer. Much like a musician, it is about the sound, not the artist, unless planned. If an artists is not focused on their craft, it will show. Puppetry is a very old art form and everyone has pretty much seen a show or two in their life no matter how old they are. Those wishing to become serious about their puppetry would do well to learn the craft thoroughly. Through workshops, master classes, one-on-one coaching. It is very hard to undo poor training. Lastly, though children have no knowledge of basic puppetry skills, they have seen enough shows at school, on TV and even on the street being performed by "Buskers", they know the difference between good and poor puppetry. They are a tough audience and have no problem voicing it or worse, leaving your show. Keep your technique polished, and your content simple and you will have a great time! Your audience will thank you for it! Literally! Read our article about the various types of puppet stages we have tried and owned! A super easy DIY Summertime craft project. 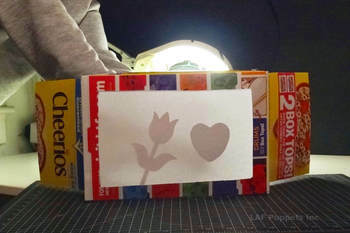 A tabletop shadow puppet stage out of a cereal box! A Cheerios cereal box made into shadow stage! WELCOME! The video above is a 45 second demo of a finished table top shadow stage that was made out of a cereal box! This simple DIY project is comprised of items found around your house and takes 1 hour to make. We at LAF Puppets believe in teaching puppetry foundations and from there it is up to you to expound on what was learned. So, as far as "embellishing" the outside of your stage, we will leave that up to you! Puppets are a fond memory to many different age groups. Everyone rememers a TV show, county fair show, Sunday School teacher where a puppet was used. So why not continue reaching the generations with a small scale puppet theater! Birthday party, scout project, small groups, a senior citizen craft, student music video, and the reason for making one goes on! No worries about the difficultly level. It is art, right? Our hope is to provide you with a simple craft that you can build upon each time you make one! Even if you have never done this type of craft before, trust us, it will be satisfying! If you can cut a straight line, you are good to go! If you have used clear tape, you are good to go! If you have used a ruler to measure 1 inch then you are good to go! If not, the photos will guide you along with our instructions. 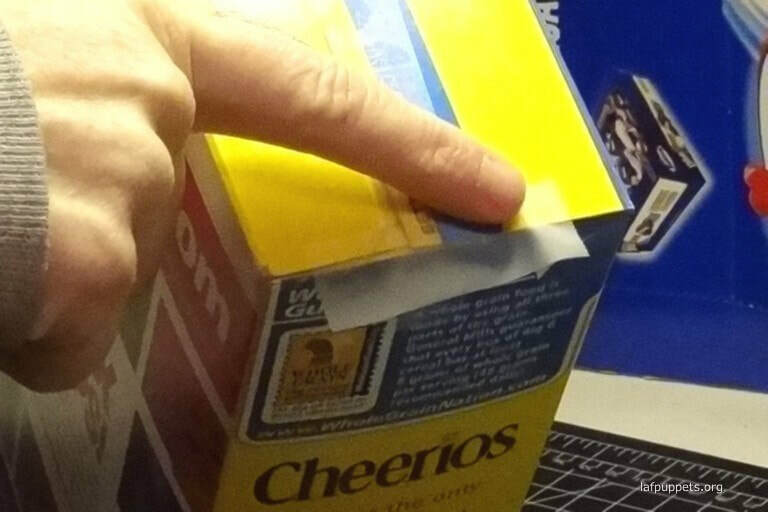 Remove contents from cereal box! Securely tape down the top of the box as if it were never opened. If you think the box is going to be handled roughly, we suggest gluing the tabs closed first and then applying tape once the glue has dried. Just make sure the tabs are closed permanently. ​Lay the empty cereal box on its side the long way, horizontal, then on the backside of the cereal box, find the center using a ruler. Mark a "dash" at the center of the box and then again at the bottom. Draw a line from the top to the bottom to create a line for you to cut along. Cut straight down the center and then along the top and bottom to create a left and right side door. See the red lines for cutting reference. Tape down all seams, edges and little corners inside the box that any part of your puppets can get caught on. Make the inside as smooth as possible with tape. Maybe even go "fancy" and use shipping tape! Doing this also reinforces the stage structure as well. Take a pencil or marker and your ruler and make dash lines about 1 inch inward (yellow arrows) from the edges of the box. You will cut along these dashes to make the "window" of the stage. See red lines in photo for cutting reference. Now cut a straight line along the hash marks you just made to cut out a "window". This is where your 1 piece of white paper will be permanently attached later. Here is what the audience will see, the front of your stage! Nice! Here is Backstage, the puppeteer's side of the stage. This is where the magic, fun, drama, special effects, are performed so the audience can view it through the window (shadow screen). Those "doors" now become the Stage Wings! TA-DA!! They hide your props as well as add stability to your stage structure. The stage wings will aid in keeping some of the light source "in" that you will be using. It is okay if some light gets out as that is part of the charm and attraction of shadow puppetry. PLEASE NOTE! If you use a light source brighter that what your stage can handle, then there is a good chance someone in your audience is going to be distracted by the overflow of too much bright light. Semi-darkness creates a coziness and theatrical intimacy that other forms of puppetry lack. Notice in movie theaters there are always "small" lights on walls, rails, etc. So, a little light outside the box is A-OK! To make the Shadow Screen, take a piece of plain white paper or wax paper and lay it down on the table. Take the box, front side down and lay it on top of the paper. Cut away all excess white paper you see as shown in the photo. We suggest trimming off a teeny bit more so that the paper sits nicely in the box. This way the edges of the paper will not rub against the wall of the box causing potential unforeseen wrinkles. NOTE: The thinner the paper the dimmer your stage lighting can be. The thicker the paper the brighter your lighting will have to be to create the shadow effect. NOTE: if you plan on painting the box, please do that process now. This step could prove to be a little tricky. The shadow screen needs to be installed as smooth as possible. The key is to glue the screen/paper as tight and taught as possible. Glue sticks are heaven sent when brand new, but old sticks that have been sitting around for a while can leave clumps behind causing wrinkles. If you are pretty good at "painting" on a thin layer of white glue, try that! Slow and smooth, in sections at a time. Yay! Here is the complete installation of your shadow screen! Great job! Looks nice and smooth! Now turn on your light source and check to see if any light is seeping through. If so, just tape that section of paper down to the cereal box. Here in step 8 we are going to make one or more puppet characters using something most households have, a nice cookie cutter! You can make a puppet from just about anything traceable or from free-hand drawing, even your very own hand! 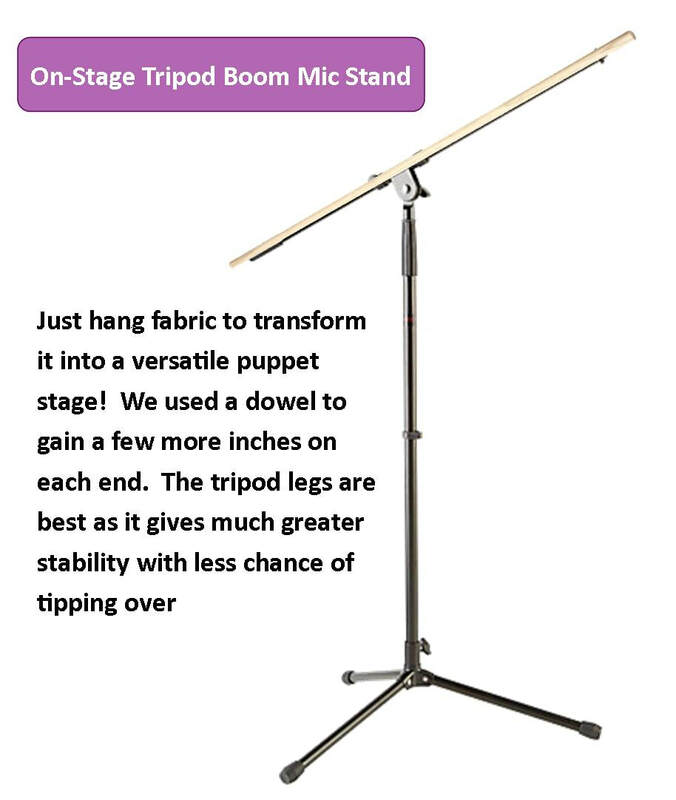 Just remember to make sure it is small enough for your stage though! As for the material used to make the puppet with, poster board is what we found. Remember that rectangle shape you cut from the front of the box in Step 5? You can re-purpose that into a some puppets! It is nice and sturdy and can take a fall or two! Perfect! Also, the darker the poster board, the better it will appear on the screen. If using a lighter colored paper, say white, either color them a solid black or take some markers to give them color and see how they look on the screen! To make the attachment needed to hold your puppet or prop, you can use a chenielle stem or a plastic straw. We had some flexi-straws handy so we used them. BBQ skewers are good as well as pencils, too! Just tape them to the middle of the puppet. With our straw, we took scissors and cut approximately 1/2 inch on each side of the straw. We then put tape on each side and placed in onto the puppet. If using a fuzzy craft stems, we suggest twisting 2 stems together. This makes them much more sturdier to hold thick paper and tape. Just bend the end of the stem into an "L" shape and tape the end like we did with the straw. In the video above, did you notice that both puppets look black even though the flower is red? Our choice of paper was rather thick and the light source was not powerful enough to bring the red out. So, play around and see what pops! ​Your tabletop puppet stage is now done! Throw on some music and get to know your creation. See what you can and can't do, what it can and can't do and get ready for Opening Night! Oh by the way, your stage doubles as storage for your puppets and props! It is also small enough to store under the bed or up in a closet, too! ​On the flip-side of utter darkness, you do not want any of your audience to be blinded either. To avoid this, keep your lighting reasonable. You do not need every light in the house on. A little directed light source goes a long way. Perhaps a flashlight set atop some books may suffice or a flexible goose-neck table top lamp might do the trick. Experiment by moving the light source closer or farther form the shadow screen to see which gives the shadow the clearest, sharpest image. For this project we used a tabletop lamp pointed into the shadow theater even though the ceiling lights were on. If your house lights are on a dimmer switch, adjust the lighting so that they are not in complete darkness. As for drapes, afternoon parties should not be a problem. Just draw the drapes to where a little light comes through, but do not close them. A little external light from another place in the room gives the same sense of "balance" and "security" to everyone. Little one's tend to fear complete darkness, and adults may have balance issues when in complete darkness, etc. So, take comfort in having a little light in. No matter how big or small your shadow stage is, the light source should be powerful for your puppets, yet not so bright that it is distracting to your audience. So, from both sides of the shadow stage, play around and see what lighting set-up works for your purpose! ​HAVE FUN WITH IT! Remember, anything can be a shadow prop or puppet! Your hands, dolls, bent fuzzy sticks (aka Chenille stems) you name it! ​Tambrateer is a participant in the Amazon Services LLC Associates Program, an affiliate advertising program designed to provide a means for sites to earn advertising fees by advertising and linking to Amazon.com. *Tambrateer is not an employee of nor is being paid by any brand name presented in this tutorial. Since 1996, Bruce & Tambra are the founders and puppeteers of LAF Puppets! FREE! Puppet Resources (PR) provides puppet scripts! We are Amazon Affiliates. Links from our blog help supplement ministry funds. Thank you for ​your support! ​Emergency tool bag for the serious traveling artist! Ours has saved us countless times!